Can I embed a form in frame? Can I only embed a frame and not a link into a button to link to a page to the form? Let me please inform you, that we do support form embedding. 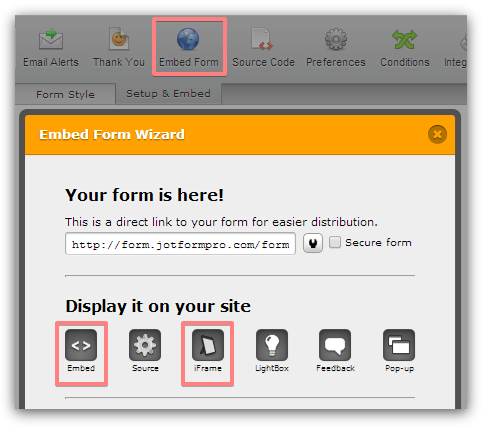 Please go to Setup & Embed tab -> click on the Embed Form icon -> and get the Embed or iFrame code for your webpage. So I can't just insert a link to the form on the web? Yes, you can. In the screenshot provided by my colleague is a box labelled This is a direct link to your form which contains the form's URL. Just copy it from there and paste it into your web page(s). If you'd like clarification on anything, do let us know.